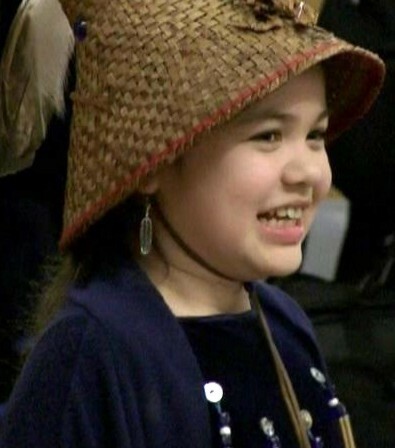 One of the youngest passengers on the Yinka Dene Alliance Freedom Train is Ta’Kaiya Blaney, 11, of Sliammon First Nation in British Columbia. I don’t believe I have seen a more articulate, self-possessed, and inspiring child in my life. She spoke in Winnipeg last night, at the Circle of Life Thunderbird House, about the struggle to stop the Enbridge Gateway Pipeline. Her presentation was impressive enough, but then she performed “Shallow Waters,” a song she co-wrote with her singing instructor, Aileen De La Cruz, and the audience was entranced. “Shallow Waters” could become the anthem for all who love and seek to protect the Earth. And Ta’Kaiya Blaney? Well, judge for yourself. She could become pretty much anything she chooses. UPDATE: After posting the first video I went to a Yinka Dene Alliance rally at the historic junction of the Red and Assiniboine Rivers. Ta’Kaiya was one of the featured speakers. Here she performs “Carried Away” – which is both a lament for the loss of the natural environment and a call to action. You can find the lyrics on her web site.